Jonathan Waverly Bachman, son of Jonathan Bachman and Frances Rhea Bachman, was born at Roseland Farm in Sullivan County, Tennessee, October 9, 1837. He died in Chattanooga , September 24, 1924. He attended Fall Branch Academy and the Blountville Academy and then entered Emory and Henry College . After graduating there he went to Illinois to teach school. In 1860 he entered the Union Theological Seminary in New York City . At the outbreak of the War Between the States he left the Seminary and entered the Confederate Army as a private in the 19th Tennessee Regiment. He was soon afterward commissioned Captain of Company G of the 60th Tennessee Regiment. He served under General Stonewall Jackson and General Robert E. Lee. He was captured and paroled in 1863. He was exchanged and was commissioned Chaplain. His commission as Chaplain was withheld (with his consent) by General Breckinridge who ordered him to command a regiment. While serving as Colonel of the Regiment, his horse was shot under him in battle. 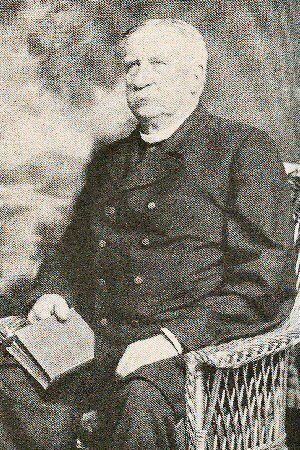 A short time later he was returned to his office as Chaplain and served in that capacity until the end of the War. He was then called to the pastorship of Churches in New Providence and Rogersville , Tennessee , and was elected President of the Rogersville College . In 1873 he was called to the First Presbyterian Church of Chattanooga which he served as pastor for fifty-one years. Many pages could be written concerning Dr. Bachman's heroic service to his people of the Presbyterian Church and his wider service to the entire community. During the yellow fever epidemic he aided all classes, creeds and colors. He helped to nurse the victims and literally helped to bury them as well as reading the service. He became the most beloved citizen in the town and was affectionately known as the "Bishop of Chattanooga." The Board of Commissioners in late years conferred upon him the title of Chaplain of Chattanooga. October 20, 1863, he married Evalina Elizabeth Dulaney, who was born in 1837 and died in 1898. She was the daughter of Dr. William R. Dulaney and Mary Taylor Dulaney. Of their ten children five survived to maturity, (1) Frances Taylor, who married William Lawson Magill; (2) Mary, who married Charles C. Anderson; (3) Anne Rhea, who married Charles R. Hyde; (4) Nathan Lynn, who married Pearl Duke; and (5) Evalina Dulaney, who married Charles Edward Buek.